To Cite: Nejati M, Teimori A, Taherkhani R, Jalilian S, Makvandi M. Investigation of the Complete Sequence of Hepatitis A virus 1B Isolated in Ahvaz City, Iran, Jundishapur J Microbiol. 2019 ; 12(2):e83965. doi: 10.5812/jjm.83965. Background: Hepatitis A virus (HAV) is a common cause of mild to acute hepatitis among children and adolescents, worldwide. Objectives: The aim of this study was to investigate the complete sequence of isolated HAV from a child with acute hepatitis. Methods: A serum sample was collected from a child with clinical sign and symptoms of acute hepatitis. Following RNA extraction, the genotype of virus was determined based on sequencing of VP1-2A region of the isolated HAV genome. The whole HAV genome was sequenced by the nested polymerase chain reaction (PCR) using specific primers. The size of the complete length of isolated HAV genome, 5UTR (Untranslated Region), and 3UTR were determined. The amino acid sequencing of single polyprotein, including VP1 and VP3 regions, were analyzed using the BioEdit software. To evaluate the isolated HAV genome, phylogenetic tree was conducted to analyze the complete HAV Genome, 5UTR, and VP1-2A regions of the isolated HAV. Simplot and RDP4 analyses were accomplished to confirm recombination in the genome of the sequestered HAV strain in Ahvaz city. Results: The sequestered HAV/Ahvaz/Iran/2015 was recorded with an accession number BankIt 2063303 MG 546669 in GenBank. The complete HAV sequence of the isolated HAV comprised of full length of 7239 nt, 5’UTR 619 nt, 3’UTR 21nt, and an open reading frame (ORF) encoding single polypeptide of 2200 amino acids (6600 nt). The whole sequences of isolated HAV strain Ahvaz/Iran/2015 showed 96% and 95% nucleotide identity with prototype strain HAV 1B isolated from Egypt (96%), South Africa (95%), and HM 175 (95%) strains, respectively. The complete amino acid sequence of the Vp1-2A region of the isolated HAV showed 100% identity with HM175 and 99% identity with isolated HAV from Egypt and South Africa. The detected HAV was identified as HAV genotype 1B. A mutation was observed in the amino acid sequences of VP3 region of the isolated HAV; this mutation showed substitution of isoleucine (I) with Arginine at position 433 amino acid sequence compared with the consensus sequences in amino acid of HM 175 strain. The results of RDP4 showed no evidence of recombination in the isolated strain HAV/Ahvaz/Iran/2015 genome. Conclusions: The isolated HAV was genotype1 B, comprised of full length of 7239 nt, 2200 amino acid. The complete amino acid sequence VP1 region of the isolated HAV showed 100% homology identity with HM175 and 99% with isolated HAV in Egypt, South Africa. A mutation was observed in the amino acid sequences of VP3 region of the isolated HAV, this mutation showed substitution of isoleucine (I) with Arginine at position 433 amino acid sequence compared with the consensus sequences amino acid of HM-175 strain. No evidence of recombination was observed in the isolated strain HAV/Ahvaz/Iran/2015 genome. Hepatitis A virus (HAV) is a food- and water-borne viral infection, prevalent in different regions of the world. Approximately, 1.4 million new instances of HAV infection occur, with 11% to 22% of the cases being hospitalized each year worldwide (1). Hepatitis A virus commonly cause mild to severe illness, self-limited disease, which leads to long-lasting immunity against the virus, and frequently appears asymptomatic in young children, whereas in older children and adults, the signs and symptoms vary from minor illness to drastic fulminant hepatic failure (1, 2). Furthermore, HAV is a hepatotropic and belongs to the family Picornaviridae. The HAV genome is made up of a 7.5-kilobase (kb), single-stranded positive RNA wrapped up by an icosahedral capsid, which is made up of 60 copies of three surface proteins, VP1, VP2, and VP3 (named as 1D, 1B, and 1C) , existing in one open reading frame (ORF) (3). The single ORF of 2217 to 2280 amino acids of HAVs are categorized to three assignment regions named P1, P2, and P3. The P1 region is responsible for producing capsid polypeptides VP1 to VP4, whereas P2 and P3 sections produce non-structural polypeptides. Hepatitis A virus genome is made up of two untranslated regions (5’UTR and 3’UTR) with a small poly (A) tail (4, 5). The HAV structural surface protein is composed of immunogenic neutralization sites (6). Analysis of the whole genome sequence has proved that HAV possesses six genotypes. Genotypes I, II, III, and VII are responsible for acute hepatitis in humans. Genotypes I and III have sub-genotypes A, B, and C. So far, genotypes IV, V, and VI have been detected in monkeys and pigs (5, 7). Currently, the complete genomic HAV sequences of genotypes IA, IB, IIA, IIIA, and IIIB have been investigated in Uruguay Egypt, France, and Japan, respectively (8-11). Genotype 1 is more dominant and sub-genotype 1A is more prevalent worldwide. The sub-genotype 1A is spreading in south and North America, Europe, Asia, and Africa, while IB is prevalent in Australia, the Middle East, and South Africa (12-16). The circulation of genotype 1B has been reported in Ahvaz city, Iran (17). Additionally, co-circulation of multiple genotypes has been documented in different regions around the world (18, 19). Hepatitis A virus is endemic in Iran and the sero-prevalnace surveys of HAV have ranged from 50% to 80% in the Iranian population (20, 21). This study aimed at extracting HAV RNA from the serum of a male child with signs of acute hepatitis and analyzing the entire sequence of HAV genotype IB genome isolated from Ahvaz city, Iran, during year 2015. This research also aimed at evaluating nucleotide sequences of 5 UTR region, VP1-2A vicinity and full-length HAV genome by analysis of phylogenetic trees, and analyzing the entire amino acid sequence of VP1 and VP3 regions of HAV IB and detecting any evidence of amino acid substitution, which might lead to mutation. Attempts were also made to assess presence of any recombination evidence in the entire nucleotide sequences of the isolated HAV genotype IB strain. This project, with the registration number AJUMS OG-94146, was approved by the Ethics Committee of Ahvaz Jundishapur University of Medical Sciences Ahvaz, Iran. Consent was obtained from the child’s parents. Serum sample was collected from a 10-year-old male child with acute hepatitis, hospitalized at Abozar hospital, Ahvaz city, Iran, in August 2015. The clinical signs and symptoms of the patient were fatigue, nausea, anorexia, vomiting, fever, hepatomegaly, dark urine, and jaundice. Laboratory examinations showed elevated liver enzymes AST: 536 U/L, ALT: 782 U/L, alkaline phosphatase: 1630 U/L, total bilirubin: 5.8 mg/dL, direct bilirubin: 3.6 mg/dL, total protein: 7.7 g/dL, albumin: 3.8 g/dL, WBC: 7000/mm3, Hb: 11.6 g/dL, platelet: 316000/mm3, and ESR: 38 mm/h. Coagulation studies showed PT: 13 seconds and PTT: 31 seconds. Serum amylase, blood sugar and serum sodium, potassium, BUN, and creatinine were within the normal range. The patient serum was positive for anti-HAV antibody (IgM) yet negative for HbcIgM, HBsAg, and HCV antibody (Diapro, Italy), according to the manufacturer’s instructions. Viral RNA was extracted from the patient serum using a QIAamp viral RNA minikit (Qiagen, Westburg, Netherlands), following the manufacturer’s instructions. The cDNA was prepared using cDNA synthesis thermo kit (Cat. NO.K1622), according to the manufacturer’s instructions. Initially, the RT-PCR was carried out for the detection of 5’UTR (untranslated region) and VP1-2A regions of the isolated HAV genome to determine HAV genotyping. The semi-nested polymerase chain reaction was used for the detection of 5UTR of the isolated HAV genome using specific primers (Table 1). In the first round, total volume of 25 µL reaction mixture containing 2.5 µL of cDNA synthesis reaction mixture, 1 µL of 10 µM each of primer, 12.5 µL PCR 2X master mix (CinnaGen, Iran), and 8 µL of nuclease-free water was subjected to the thermal cycler (TeQlab, Germany). The thermal conditions were programmed with denaturation step for four minutes at 95°C during 30 cycles, followed by 30 seconds at 95°C, annealing for 45 seconds at 55°C and extension for 30 seconds at 72°C and final extension step for eight minutes at 72°C. In the second round PCR, the reaction mixture contained: 2.5 µL of the first round PCR product was used as a template, 1 µL of 10 µM each of primer, 12.5 µL PCR 2X master mix (CinnaGen, Iran), 2 µL DMSO and 7 µL nuclease-free water was subjected to thermal cycler for 30 cycles. The same thermal condition, as mentioned in the first run, was also used for the second run. The PCR products were analyzed by electrophoresis through 2% agarose gel. The predicted PCR product size for 5’UTR was 281 bp. The nested polymerase chain reaction was used for the detection of VP1-2A of the isolated HAV genome using specific primers (Table 1). For the first round, the reaction mixture contained 2.5 µL of cDNA synthesis reaction mixture, 1 µL of 10 µM each of primer, 12.5 µL PCR 2X master mix (Sina Gene, Iran), and 8 µL nuclease-free water was subjected to thermal cycler (TeQlab, Germany). The thermal conditions was programmed with a denaturation step for four minutes at 95°C, followed by 30 cycles: 30 seconds at 95°C, annealing for 45 seconds at 55°C and extension for 30 seconds at 72°C and final extension step for eight minutes at 72°C. In the second round, the reaction mixture comprised of 2.5 µL of the PCR product, first round was used as a template, 1 µL of 10 µM each of primer, 12.5 µL PCR 2X master mix (Sina Gene, Iran), 2 µL DMSO, and 7 µL nuclease-free water was subjected to thermal cycler for 30 cycles. The same thermal condition, as mentioned in the first run, was used for the second run. The PCR products were analyzed by electrophoresis through 2% agarose gel. The predicted PCR product size for VP1-2A was 234 bp (17). Based on the results of sequencing and blasting of 5 UTR (untranslated Region) and VP1-2A, the isolated virus was determined as HAV genotype 1B. Thus, based on these results, the complete sequence of the isolated HAV genome was generated using specific primers (Table 2) (22). The nested PCR was carried out for the complete genome of the isolated HAV IB using specific primers (Table 2) (22). For the first round, the reaction mixture contained 2.5 µL of cDNA synthesis reaction mixture, 1 µL of 10 µM each of primer, 12.5 µL PCR 2X master mix (Sina Gene, Iran), and 8 µL nuclease-free water was subjected to the thermal cycler (Teqlab, Germany). The thermal conditions was programmed with a denaturation step for four minutes at 95°C; followed by 30 cycles for 30 seconds at 95°C, annealing for 55 seconds at (50 to 59°C) and extension for 30 seconds at 72°C and final extension step eight minutes at 72°C. For the second round, the reaction mixture comprised of 3.5 µL of the first run product as the template, 1 µL of 10 µM each of primer, 12.5 µL PCR 2X master mix (Sina Gene, Iran), 2 µL Dimethyl sulfoxide (DMSO), and 6 µL nuclease-free water, and was subjected to thermal cycler for 30 cycles. The same rhermal conditions, as mentioned in the first run, was used for the second run. The PCR products were analyzed by electrophoresis through 2% agarose gel. The expected PCR products and size were 650 to 750 bp. The amplicons of different segments of whole HAV genome was sequenced by ABI 3730xl DNA sequencer (Applied Biosystems, USA). Next, the recorded sequences were aligned and the overlapped sequences were trimmed using the Snap gene tool software. The whole sequences of the HAV genome was blasted to determine the rate of identity of the isolated HAV, with the other completed sequences of the HAV genomes isolated in different regions with accession numbers registered in NCBI [National Center for Biotechnology Information (NCBI) (http://www.ncbi.nlm.nih.gov/BLAST/)]. The complete sequence of HAV genome was sent to Gene Bank to obtain the accession number. The nucleotide sequences of 5UTR, VP1-2A, and complete sequence of the isolated HAV genome were aligned with the following different HAV genotypes isolated from different regions of the world, using the Clustral W method. The tree topology was built according to the maximum-likelihood under the Tamura-Nei substitution model with the site heterogeneity gamma and invariant sites using the MEGA 6 software. The scale bars represent the frequency of nucleotide substitutions. The accuracy of the tree was assessed by 1000 bootstrap replicates (23). The phylogenetic tree with maximum likelihoods was constructed for nucleotide sequences of the VP1/2A region of the isolated HAV IB using the mega 6 software. To do this, the following reference strains were retrieved from GenBank: AB279735.1, AAA45466.1, AAA45465.1, BAF63623.1, BAF63622.1, AAK44219.2, ABI98019.1, AGG09244.1, AEN93981.1, BAK82406.1, BAO09704.1, AAU87586.1, AHX22536.1, AFJ44190.1, ADR00407.1 BAP86928.1 APD28352.1, APD15889.1, and ABN09955.1. The mentioned reference strains were different genotypes of IA, IB, IB, IIA, IIB, IIIA, and IIIB, isolated from different regions of the world. The phylogenic tree with maximum likelihood was constructed for complete sequences of the isolated HAV genome using the Mega 6 software. Complete sequences of the isolated HAV (BankIt 2063303, MG546668) was evaluated with the different genotypes of HAV references strains retrieved in GenBank: M14707.1, KYAB279735.1, AB27934.1, AY644670.1, DQ991030.1, KC182590.1, HQ246217.1, AB623053.1, AY644676.1, AB839697.1, KJ427799.1, JQ655151.1, HM769724.1, EF207320.1, AB909123.1, KY003229.1, BankIt 2063303, MG546668 and KX228694.1. The entire amino acid sequence of Vp1-2A and VP3 of the isolated HAV was compared to amino acid sequences of HAVIB isolated from different regions of the world using the BioEdit software version (7.1.11). The SimPlot methods (version 3.5.1) was used for analysis of similarity among the HAV genomes (24). The criteria for similarity plot analysis of the entire genomes of isolated HAV strain with other isolated HAV strains retrieved from gene bank were programmed with a sliding window of 200 nt moving in 20-nt steps, Kimura 2-parameter distance, and T/t = 2, neighbor joining (24). The RDP4 is the current model of recombination detection program (RDP), a Windows computer program that implements an immense arrangement of methods for identification and envisaging recombination in, and clear confirmation of recombination from, virus genome sequence alignments. The modernity in RDP4 includes (1) recognition between recombination and genome segment assortment, (2) the assessment of recombination breakpoint confidence intervals, (3) a diversity of ‘recombination enlightened’ (4) visualization of multiple recombination events, and (5) a new assay to identify the impacts of gene arrangements, encoded protein structure, nucleic acid secondary structure, nucleotide composition, and nucleotide diversity on recombination breakpoint patterns (25). Therefore, as mentioned above, the RDP4 was used for the evidence of recombination in the isolated HAV genome from Ahvaz. HAV/Ahvaz/Iran/2015 strain was isolated from a serum sample of a patient with clinical sign and symptoms of acute hepatitis, positive for HAVIgM in Ahvaz city, Iran, August 2015. The complete genome of the isolated HAV strain from a patient (Ahvaz strain) under accession number BankIt 2063303, MG546668 was deposited in the Gene Bank (NCBI). The results of alignment of complete sequence of HAV/Ahvaz/2015 showed that the isolated strain was HAV genotype 1B. The isolated HAV genotype 1B strain was 7239 nt in length, with a 619 bp 5’UTR, 21bp 3’UTR, and an ORF encoding a polypeptide of 2200 amino acids. A resemblance rate of 98% to 99% was procured when contrasting the 619 nucleotides of the Iranian 5UTR region of the HAV isolated strain with references KX228694.1 HAV IB/Egypt/2015and HM175 M14707.1 HAV IB (HM-175, wild type), respectively. A similarity rate of 99% was procured when comparing nucleotides of the Iranian VP1-2A region of the HAV isolated strain to HAV genotype 1B references AAA45466.1 HAV IB HM175 strain (Australia), APD15889.1 HAV IB/Egy/2015, and APD28352.1 HAV IB South Africa. A similarity rate of 95% to 96% was obtained when comparing the 7239 nucleotides of the Iranian full genome of the HAV isolated strain to references KX228694.1 HAV IB/Egypt/2015, South Africa (KY003229.1 and HM175 M14707.1 HAV IB (HM-175, wild type), respectively. The results of phylogenetic tree analysis of 5UTR of the HAV (BankIt 2063303, MG546668) showed that it formed a cluster with other isolated HAV genotype1, KX228694.1 HAV IB/Egypt/2015, South Africa (KY003229.1 and HM175 M14707.1 HAV IB (HM-175, wild type) (Figure 1). Figure 1. Phylogenetic analysis of 5’UTR region of the isolated HAVIB genome was constructed by maximum-likehood using MEGA 6. Iranian sequence is indicated by black circular with accession number BankIt 2063303 MG 546669 strains in the tree are shown by accession numbers, and their genotype and geographic region of isolation. Numbers on the branches exhibit bootstrap values acquired after 1,000 replications of bootstrap sampling. Scale bars = 0.02. 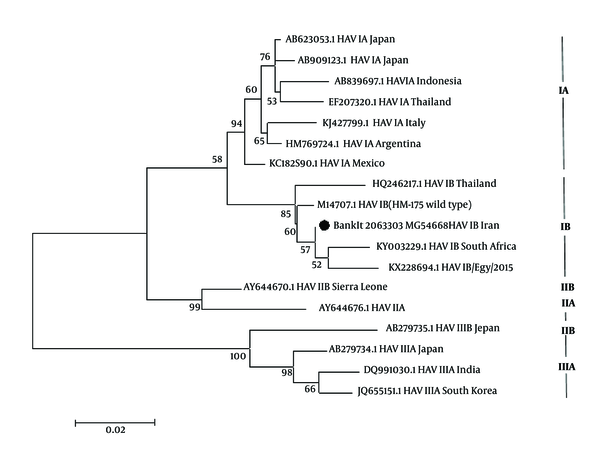 The results of phylogenetic tree analysis of VP1-2A of the HAV (BankIt 2063303, MG546668) showed a phylogenetic cluster with other isolated HAV genotypes IB, including, AAA45466.1 HAV IB HM175 strain (Australia), APD15889.1 HAV IB/Egy/2015 and APD28352.1 HAV IB South Africa (Figure 2). Figure 2. Phylogenetic analysis of VP1-2A genomes of Ahvaz HAV1B was constructed by maximum-likehood using MEGA 6. Iranian sequence is indicated by black circular with accession number BankIt 2063303 MG 546669 strains in the tree are shown by accession numbers, and their genotype and geographic region of isolation. Numbers on the branches display bootstrap values acquired after 1,000 replications of bootstrap sampling. Scale bars = 0.01. The results of phylogenetic tree analysis of complete sequence the HAV (BankIt 2063303, MG546668) displayed a phylogenetic cluster with other isolated HAV genotype IB, KX228694.1 HAV IB/Egypt/2015, South Africa (KY003229.1 and Australia HM175 M14707.1 HAV IB (HM-175, wild type) (Figure 3). Figure 3. Phylogenetic analysis of full-length genomes of HAV IB genome was constructed by maximum-likehood using MEGA 6. Iranian sequence is indicated by black triangle with accession number BankIt 2063303 MG 546669 strains in the tree are shown by accession numbers, and their genotype and geographic region of isolation. Numbers on the branches indicate bootstrap values gained after 1,000 replications of bootstrap sampling. Scale bars = 0.05. The results of BioEdit showed the substitution of isoleucine (I) with arginine was found in amino acid sequences of VP3 gene of the isolate HAV IB (BankIt 2063303, MG546668), at position 433 when compared to VP3 gene of consensus sequences amino acid (Figure 4). The analysis of sequences of Vp1-2A gene of the HAV, BankIt 2063303 MG 546669, revealed 100% homology with consensus sequences amino acid HAV HM 175 genotype IB (Figure 5). Figure 4. The consensus amino acid sequence of HAV genotype is seen on the top. The sequences of VP3 gene of the HAV, BankIt 2063303 MG 546669 in position 433 compared with the consensus sequence amino acid indicated a isoleucine (I) substitution with Arginine. Until now this sort of mutation has not been described in any HAV IB genotype. The dots display conserved amino acid and the amino acid code indicates differences with the consensus amino acid. Figure 5. The consensus amino acid sequence of HAV genotype is presented on the top. The sequences of VP1-2A gene of the HAV, BankIt 2063303 MG 546669 compared with the consensus sequences amino acid indicated 100% homology with HAV HM 175 genotype IB. The dots exhibit conserved amino acid and the amino acid code presents differences with the consensus amino acid. The analysis of simplot revealed that the completed sequences of isolated HAV IB exhibited 95% to 96% similarity with almost all HAV IB, KX228694.1 HAV IB/Egypt/2015, South Africa (KY003229.1 and HM175 M14707.1 HAV IB (HM-175, wild type) isolated from different regions of the world (Figure 6). The results of RDP4 program revealed no evidence of recombination was found in the isolated strain HAV/Ahvaz/Iran/2015 with other different HAV isolates from different regions of the world retrieved from gene Bank. Molecular description of HAV is important for comprehension, its spreading pattern, and evolutionary relationships. In this study, the HAV genome was isolated from a serum of a 10-year-old child with clinically suspected acute hepatitis. The full sequence of HAV genome (strain HAV/Ahvaz/Iran/2015) was determined. This investigation is the first comprehensive study on complete sequences of HAV genotype IB in Iran. Based on the results of sequencing of 5UTR and VP1-2A regions, the isolated HAV was found to be genotype IB with accession number BankIt 2063303 MG 546669. These findings might indicate a sign for more extensive consideration of other HAV strains in Iran. The isolated HAV comprised of full length of 7239 nt, 5’UTR 619 nt, 3’UTR 21nt, and an ORF encoding single polypeptide of 2200 amino acids (6600 nt). The whole sequences of the isolated HAV strain Ahvaz/Iran/2015 showed 96% and 95% nucleotide identity with prototype strain HAV 1B isolated from Egypt (96%), South Africa (95%), and HM 175 (95%) strains, respectively. The results of phylogenetic tree of HAV 5UTR sequence revealed that the isolated HAV IB (BankIt 2063303 MG 546669) was located on one branch of the tree along with isolated HAV IB from, Egypt, Thailand, Australia (16, 26, 27), and South Africa South Africa (KY003229.1) (Figure 1). 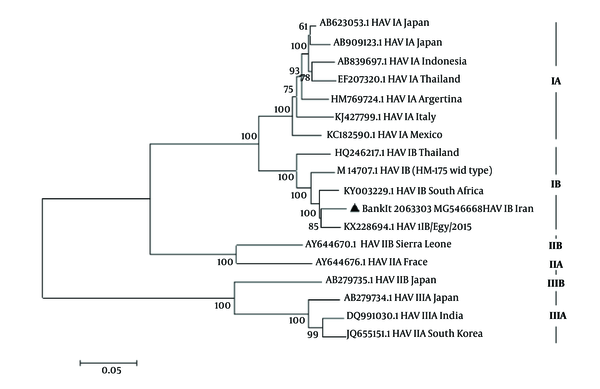 The results of phylogenetic tree of VP1-2A sequence revealed that the isolated HAV IB (BankIt 2063303 MG 546669) had been clustered on one branch of the tree along with isolated HAV IB from Egypt, Thailand, Australia (16, 28, 29), and South Africa (APD28352.1). The results of phylogenetic tree of complete sequence of HAV revealed that the isolated HAV IB (BankIt 2063303 MG 546669) was located on one branch of the tree along with the complete sequences of HAV IB from Egypt, Thailand, Australia (16, 26, 27), and South Africa South Africa (KY003229.1) (Figure 1). Thus, based on the evaluation of 5UTR and VP12-A and the complete sequence of the HAV isolated from different regions of the world, it was confirmed that the isolated HAV strain from Ahvaz was a genotype IB. Nejati et al. reported that the circulation of HAV genotype 1B among children with acute hepatitis A was dominant in Ahvaz city, Iran (17). The molecular epidemiology of HAV is limited in Iran and it is required to be investigated in different parts of Iran. The analysis of VP3 regions of the isolated HAV (BankIt 2063303 MG 546669) showed 99% amino acid identity with the HAV genotype 1B isolated in Egypt (16) and South Africa (accession number, KY003229.1). The whole amino acid sequences of VP3 gene region of the isolated HAV at position 433 contrasted with the consensus amino acid sequence and pointed out a isoleucine (I) substitution with arginine, which reveals the presence of a new mutation in the VP3 region (BankIt 2063303, MG546668) (Figure 4). Until now, this sort of mutation has not been delineated in the HAV IB genotype. 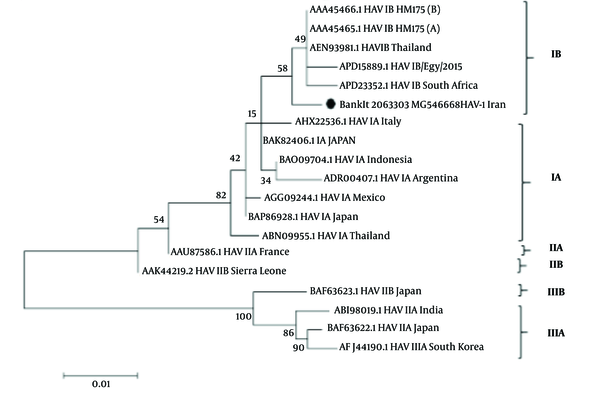 The analysis of VP1 regions of the isolated HAV (BankIt 2063303 MG 546669) showed 100% amino acid identity with the HAV genotype 1B isolated from Egypt (APD15889.1), HAV IB South Africa (APD28352.1), HM175 HAV IB Australia (AAA45466.1), and HAV IB Thailand (AEN93981.1) (Figure 5). Both VP3 and VP1 are HAV capsid proteins and showed important neutralization antibody properties in HAV vaccine design. The results of complete sequences of HAV strains Simplot confirmed the presence of high similarities greater than 75% among the different isolated HAV genotypes with the isolated HAV (BankIt 2063303, MG546668) from Ahvaz city (Figure 6). The result of RDP4 revealed no evidence of recombination observed in the isolated strain HAV/Ahvaz/Iran/2015 genome from Ahvaz. The evidence of recombination between two different HAV genotypes have also been reported. Hamza et al. (2017, Egypt) reported the evidence of recombination between X75215 (HAV genotype IA) and AF268396 (HAV genotype IB) resulting in a fragment of 2B non-structural protein coding region (nucleotides 3757 - 3868) and concluded the presence of a true recombinant (16). A recombination episode in the VP1capsid protein gene of HAV strain 9F94 was narrated by Costa-Mattioli et al. (30). Liu et al. exhibited recombination episodes between the Japanese strain HAV IA and the North African strain HAV IB, which contribute to the recombinant uruguayan strain HAV5 (3). The third recombination event was found between MBB (M20273, subgenotype IB) and the German strain GBM (X75215, HAV genotype IA), resulting in the Italian strain FG (X83302) (3). Aguirre et al. reported a recombination episode between the HAV-Argentinian (HAV genotype IA) and the Brazilian (HAV genotype IB) that was detected in the small segment C-terminal of the 2C protein and the N-terminal segment of the 3A protein (28). Belalov et al. analyzed the entire HAV genome of the different genotypes described in different regions of the world. They observed intra-typic recombination episode only among the HAV subtype IA and HAV subtype IIIA yet no evidence of recombination occurred among the different HAV genotypes. He concluded that although the amino acid sequences of capsid protein among the HAV sub-genotypes were conserved, the presence of intra-typic recombination episodes might still play an important role in HAV evolution (29). In Iran, according to seroprevalence data from mid-2013, there is a common rate of HAV seroprevalnace while in rural areas it occurs with high seroprevalence (17, 20, 21). These alterations have developed from improvements in hygiene, sanitation, and the standards of drinking water, and represent enhancement in the living standards and socioeconomic progress. In some countries, such as Japan, the figure of hepatitis A cases have reduced continuously since the 1990s due to ameliorated sanitary conditions (31). The HAV RNA was isolated from serum of a child with symptoms of acute hepatitis. The entire HAV genome genotype IB was sequenced. The single polyprotein of isolated HAV IB comprised of 2200 amino acids. The complete amino acid sequence VP1-2A region of the isolated HAV showed 100% homology identity with HM175 and 99% with isolated HAV in Egypt, South Africa. The whole amino acid sequences of VP3 gene region of the isolated HAV at location 433 contrasted with the consensus sequence amino acid exhibited an isoleucine (I) substitution with arginine. Until now, such mutation has not been determined elsewhere. No evidence of recombination was observed in the isolated strain HAV/Ahvaz/Iran/2015 genome. The data on seroepidemiological and molecular data of HAV infections are limited in Iran, therefore, to implement preventive measures and control the spread of HAV, determination of HAV subgenotypes need to be investigated in other provinces of Iran, including Tehran, Fars, Isfahan, Khorasan, Kerman, Bushehr, and Gillan. This study was conducted as a research project with registration number OG-94146 carried out by Mehrab Nejati (PhD, virology). The authors appreciate all efforts made by the personnel of the laboratory of Abuzar Children’s Hospital, for providing the samples of their research, as well as the Chief of Infectious and Tropical Diseases Research Center, for their approval and financial support of this study. Finally, the authors would like to extend their gratitude to Somayeh Biparva Haghighi, assistant professor of applied linguistics at Ahvaz Jundishapur University of Medical Sciences, for her precise language editing of the manuscript. Funding/Support: This project was financially supported by Infectious and Tropical Diseases Research Center, Health Research Institute, Ahvaz Jundishapur University of Medical Sciences, Ahvaz, Iran. 1. Advisory Committee on Immunization P, Fiore AE, Wasley A, Bell BP. Prevention of hepatitis A through active or passive immunization: recommendations of the Advisory Committee on Immunization Practices (ACIP). MMWR Recomm Rep. 2006;55(RR-7):1-23. [PubMed: 16708058]. 2. Melhem NM, Talhouk R, Rachidi H, Ramia S. Hepatitis a virus in the Middle East and North Africa region: A new challenge. J Viral Hepat. 2014;21(9):605-15. doi: 10.1111/jvh.12282. [PubMed: 25040644]. 3. Liu W, Zhai J, Liu J, Xie Y. Identification of recombination between subgenotypes IA and IB of hepatitis A virus. Virus Genes. 2010;40(2):222-4. doi: 10.1007/s11262-009-0431-5. [PubMed: 20012679]. 4. Totsuka A, Moritsugu Y. Hepatitis A virus proteins. Intervirology. 1999;42(2-3):63-8. doi: 10.1159/000024967. [PubMed: 10516462]. 5. Yong HT, Son R. Hepatitis A virus: A general overview. Int Food Res J. 2009;16:455-67. 6. Pinto RM, Aragones L, Costafreda MI, Ribes E, Bosch A. Codon usage and replicative strategies of hepatitis A virus. Virus Res. 2007;127(2):158-63. doi: 10.1016/j.virusres.2007.04.010. [PubMed: 17524513]. 7. Arauz-Ruiz P, Sundqvist L, Garcia Z, Taylor L, Visona K, Norder H, et al. Presumed common source outbreaks of hepatitis A in an endemic area confirmed by limited sequencing within the VP1 region. J Med Virol. 2001;65(3):449-56. doi: 10.1002/jmv.2056. [PubMed: 11596077]. 8. Garcia-Aguirre L, Cristina J. Analysis of the full-length genome of hepatitis A virus isolated in South America: Heterogeneity and evolutionary constraints. Arch Virol. 2008;153(8):1473-8. doi: 10.1007/s00705-008-0151-5. [PubMed: 18594941]. 9. Frank C, Walter J, Muehlen M, Jansen A, van Treeck U, Hauri AM, et al. Large outbreak of hepatitis A in tourists staying at a hotel in Hurghada, Egypt, 2004--orange juice implicated. Euro Surveill. 2005;10(6). E050609 2. [PubMed: 16783096]. 10. Desbois D, Couturier E, Mackiewicz V, Graube A, Letort MJ, Dussaix E, et al. Epidemiology and genetic characterization of hepatitis A virus genotype IIA. J Clin Microbiol. 2010;48(9):3306-15. doi: 10.1128/JCM.00667-10. [PubMed: 20592136]. [PubMed Central: PMC2937740]. 11. Endo K, Takahashi M, Masuko K, Inoue K, Akahane Y, Okamoto H. Full-length sequences of subgenotype IIIA and IIIB hepatitis A virus isolates: characterization of genotype III HAV genomes. Virus Res. 2007;126(1-2):116-27. doi: 10.1016/j.virusres.2007.02.005. [PubMed: 17376556]. 12. Cristina J, Costa-Mattioli M. Genetic variability and molecular evolution of hepatitis A virus. Virus Res. 2007;127(2):151-7. doi: 10.1016/j.virusres.2007.01.005. [PubMed: 17328982]. 13. Nainan OV, Xia G, Vaughan G, Margolis HS. Diagnosis of hepatitis a virus infection: A molecular approach. Clin Microbiol Rev. 2006;19(1):63-79. doi: 10.1128/CMR.19.1.63-79.2006. [PubMed: 16418523]. [PubMed Central: PMC1360271]. 14. Pinto RM, Alegre D, Dominguez A, El-Senousy WM, Sanchez G, Villena C, et al. Hepatitis A virus in urban sewage from two Mediterranean countries. Epidemiol Infect. 2007;135(2):270-3. doi: 10.1017/S0950268806006753. [PubMed: 16817987]. [PubMed Central: PMC2870566]. 15. Reuter G, Juhasz A, Kosztolanyi L, Lefler E, Fekete Z. Co-circulation of genotype IA and new variant IB hepatitis A virus in outbreaks of acute hepatitis in Hungary--2003/2004. J Med Virol. 2006;78(11):1392-7. doi: 10.1002/jmv.20710. [PubMed: 16998889]. 16. Hamza H, Abd-Elshafy DN, Fayed SA, Bahgat MM, El-Esnawy NA, Abdel-Mobdy E. Detection and characterization of hepatitis A virus circulating in Egypt. Arch Virol. 2017;162(7):1921-31. doi: 10.1007/s00705-017-3294-4. [PubMed: 28303345]. 17. Nejati A, Makvandi M, Samarbafzadeh A, Neisi N, Moradzadegan H. Molecular epidemiology of hepatitis A virus in patients in the Ahwaz region of Iran. J Med Virol. 2012;84(4):582-6. doi: 10.1002/jmv.23238. [PubMed: 22337296]. 18. Villar LM, Morais LM, Aloise R, Melo MM, Calado IA, Lampe E, et al. Co-circulation of genotypes IA and IB of hepatitis A virus in Northeast Brazil. Braz J Med Biol Res. 2006;39(7):873-81. doi: 10.1590/S0100-879X2006000700004. [PubMed: 16862277]. 19. de Paula VS, Baptista ML, Lampe E, Niel C, Gaspar AM. Characterization of hepatitis A virus isolates from subgenotypes IA and IB in Rio de Janeiro, Brazil. J Med Virol. 2002;66(1):22-7. doi: 10.1002/jmv.2106. [PubMed: 11748654]. 20. Mostafavi N, Kelishadi R, Kazemi E, Ataei B, Yaran M, Motlagh ME, et al. Comparison of the prevalence and risk factors of hepatitis A in 10 to 18-year-old adolescents of sixteen Iranian provinces: The CASPIAN-III study. Hepat Mon. 2016;16(9). e36437. doi: 10.5812/hepatmon.36437. [PubMed: 27822259]. [PubMed Central: PMC5091029]. 21. Izadi M, Esfahani AA, Hassannia H, Jonaidi Jafari N, Rahmati Najarkolaei F, Rezaee-Zavareh MS. Seroprevalence of hepatitis A virus among Iranian soldiers. Gastroenterol Hepatol Bed Bench. 2016;9(2):100-4. [PubMed: 27099669]. [PubMed Central: PMC4833848]. 22. Vaughan G, Forbi JC, Xia GL, Fonseca-Ford M, Vazquez R, Khudyakov YE, et al. Full-length genome characterization and genetic relatedness analysis of hepatitis A virus outbreak strains associated with acute liver failure among children. J Med Virol. 2014;86(2):202-8. doi: 10.1002/jmv.23843. [PubMed: 24243548]. 23. Nei M. Phylogenetic analysis in molecular evolutionary genetics. Annu Rev Genet. 1996;30:371-403. doi: 10.1146/annurev.genet.30.1.371. [PubMed: 8982459]. 24. Strimmer K, Forslund K, Holland B, Moulton V. A novel exploratory method for visual recombination detection. Genome Biol. 2003;4(5):R33. [PubMed: 12734013]. [PubMed Central: PMC156589]. 25. Martin DP, Murrell B, Golden M, Khoosal A, Muhire B. RDP4: Detection and analysis of recombination patterns in virus genomes. Virus Evol. 2015;1(1):vev003. doi: 10.1093/ve/vev003. [PubMed: 27774277]. [PubMed Central: PMC5014473]. 26. Theamboonlers A, Abe K, Thongmee C, Poovorawan Y. Complete coding sequence and molecular analysis of hepatitis A virus from a chimpanzee with fulminant hepatitis. J Med Primatol. 2012;41(1):11-7. doi: 10.1111/j.1600-0684.2011.00515.x. [PubMed: 22017331]. 27. Ticehurst JR, Racaniello VR, Baroudy BM, Baltimore D, Purcell RH, Feinstone SM. Molecular cloning and characterization of hepatitis A virus cDNA. Proc Natl Acad Sci U S A. 1983;80(19):5885-9. [PubMed: 6310601]. [PubMed Central: PMC390180]. 28. Aguirre S, Malirat V, Scodeller E, Mattion N. First full-length genomic sequence of a hepatitis A virus isolated in Argentina shows recombination between subgenotypes IA and IB. Virus Res. 2011;155(1):316-24. doi: 10.1016/j.virusres.2010.10.030. [PubMed: 21056065]. 29. Belalov IS, Isaeva OV, Lukashev AN. Recombination in hepatitis A virus: Evidence for reproductive isolation of genotypes. J Gen Virol. 2011;92(Pt 4):860-72. doi: 10.1099/vir.0.024786-0. [PubMed: 21216988]. 30. Costa-Mattioli M, Ferre V, Casane D, Perez-Bercoff R, Coste-Burel M, Imbert-Marcille BM, et al. Evidence of recombination in natural populations of hepatitis A virus. Virology. 2003;311(1):51-9. doi: 10.1016/S0042-6822(03)00109-0. [PubMed: 12832202]. 31. Yano K, Tamada Y, Yatsuhashi H, Komori A, Abiru S, Ito K, et al. Dynamic epidemiology of acute viral hepatitis in Japan. Intervirology. 2010;53(1):70-5. doi: 10.1159/000252788. [PubMed: 20068345].